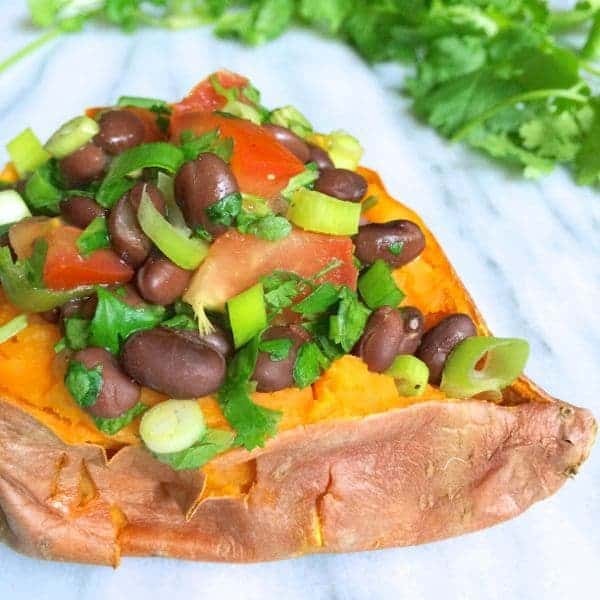 Naturally vegan and gluten free, you won’t miss the meat in these protein-packed Black Bean Salsa Stuffed Sweet Potatoes bursting with southwest flavors. Whether you are vegan, observe Meatless Monday or simply want to save money by eating more plant-based forms of protein, this dish is for you. We always have sweet potatoes on hand so inevitably, these black bean stuffed sweet potatoes end up being my lunch at least once a week. To save time, I pop the sweet potatoes in the microwave for 6 minutes instead of turning on the hot oven. While the sweet potatoes cook, I chop a few fresh veggies and open up a can of black beans. Since I recently planted cilantro in herb garden, I’m likely to make these even more than usual. Fresh lime juice is ideal but lemon juice or even rice wine vinegar works fine. I happened to have tomatoes and scallions to use up but I’ve also used red peppers, avocado, fresh corn and more. This time of year when the farmers markets are overflowing with produce, you really can’t go wrong. Serve with plain yogurt, guacamole, hot sauce or even top with a fried egg for extra protein. This flavor packed, effortless meal will soon become one of your favorites. 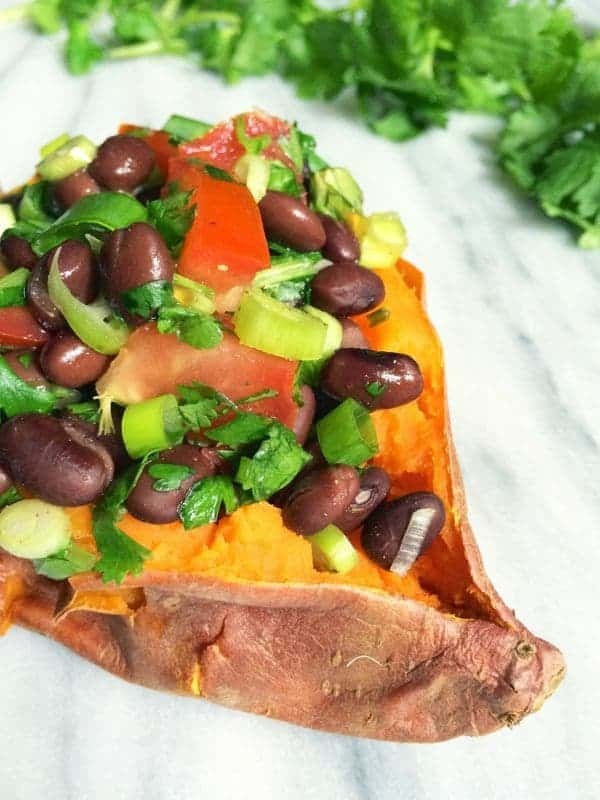 Naturally vegan and gluten free, you won't miss the meat in these protein-packed Black Bean Salsa Stuffed Sweet Potatoes bursting with southwest flavors. 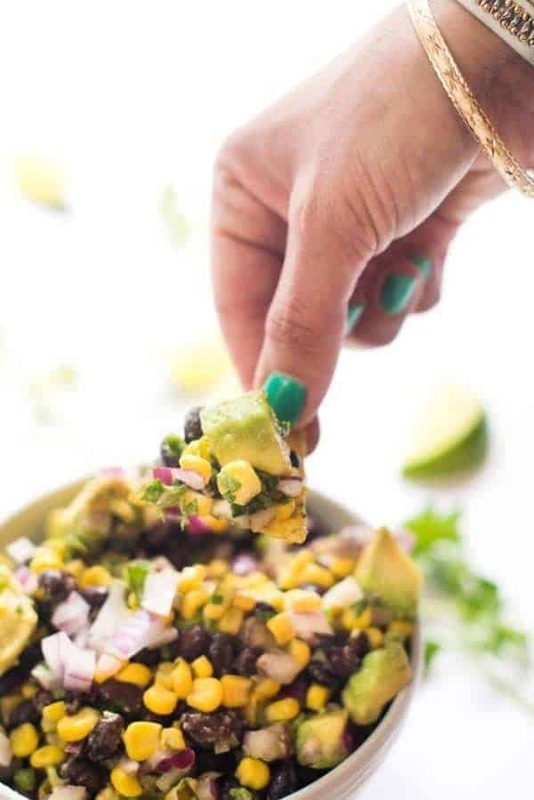 While potatoes are cooking, mix together black bean salsa but combining all remaining ingredients in a medium bowl: black beans through cayenne. Toss well and check for seasoning. Adjust accordingly. 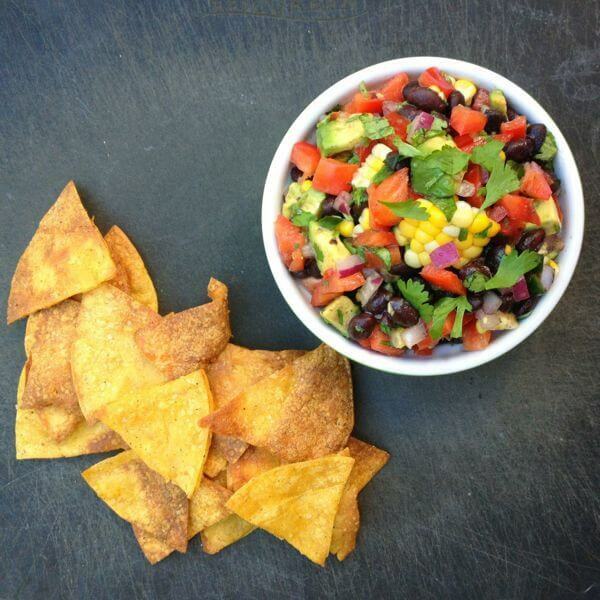 To serve, slice open each sweet potato and stuff with equal portions of the black bean salsa. 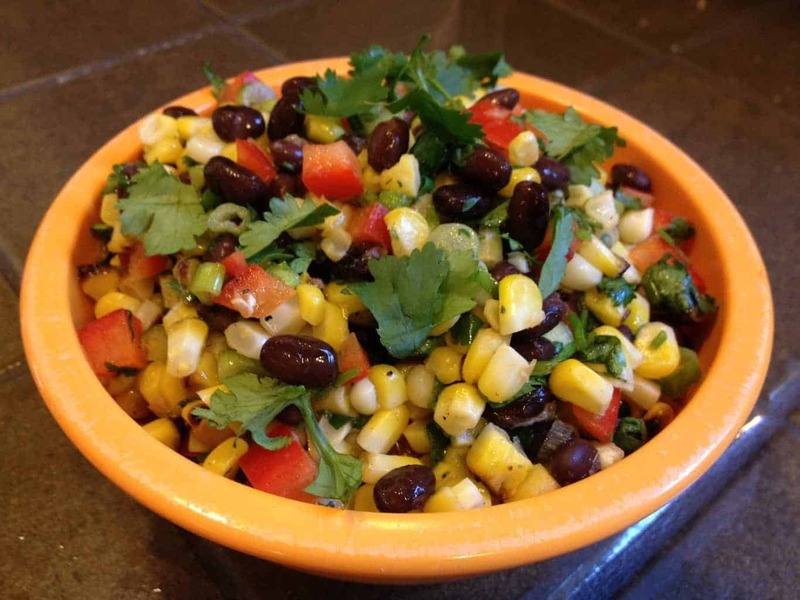 Top with additional cilantro and any other garnishes you wish such as plain yogurt, hot sauce or even a fried egg. Love that this recipe is naturally gluten-free and vegan – no need for animal meat or gluten-free substitutes. Will definitely be trying out this recipe soon! Your blog is awesome! These stuffed sweet potatoes look so hearty and comforting…I think I know what I shall be having for dinner tonight. Simple + comforting, yum! Aww thank you so much Tash! This is one of my favorite go-to meals! Great combo here, thanks for the introduction! Black beans and sweet potatoes are one of my favorite food combos! Such a great pair. This looks oh so delicious. We love stuffed sweet potatoes for how easy and versatile they are! 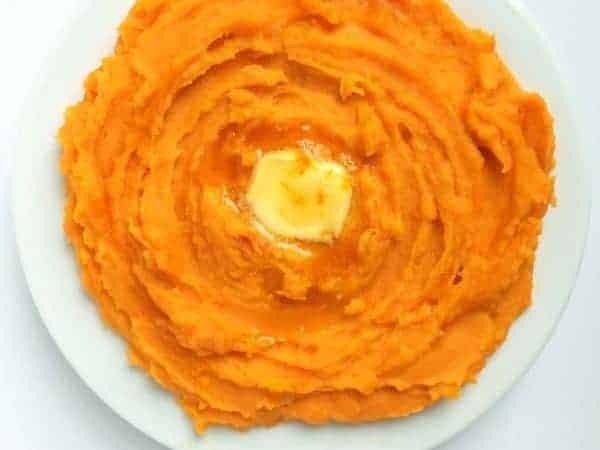 I make a different version of stuffed sweet potatoes and love them as a hearty yet healthy meal. Yours look beautiful! I love black beans and sweet potatoes. They go so well together. These look so yummy! I will never say no to a tater stuffed with delicious salsa!! Drooling!! Heck yes!! Thank you Lauren! How have I never had a stuffed sweet potato?! 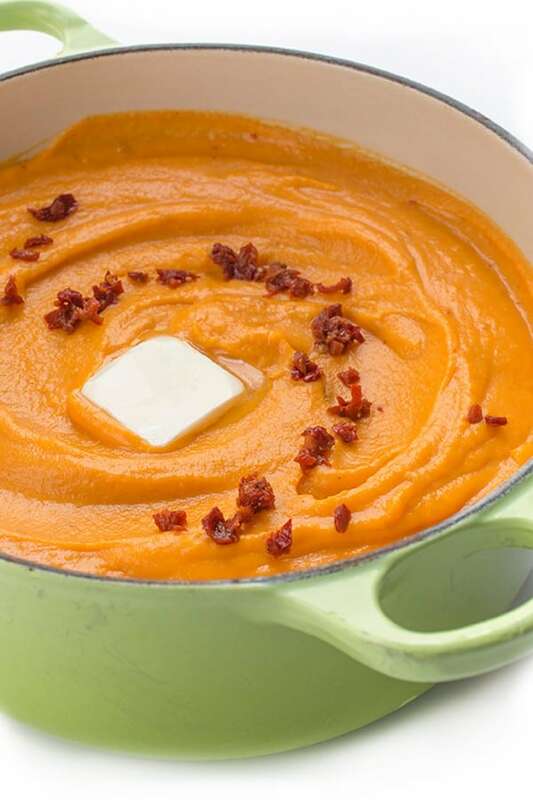 I love sweet potatoes so this is a great idea – such a great protein-packed meal! Once you see how easy and fast they are you will be hooked! This is my kind of meal! So awesome! They look so tasty Liz!